If you've got an idea for a way your company can be a part of the Black & Pink Ball, we're all ears! Send us a message and someone will contact you shortly. It is with great pleasure and anticipation that Children's Center for Dance Education announces the Black & Pink Ball Fundraising Gala to support dance education in our community. 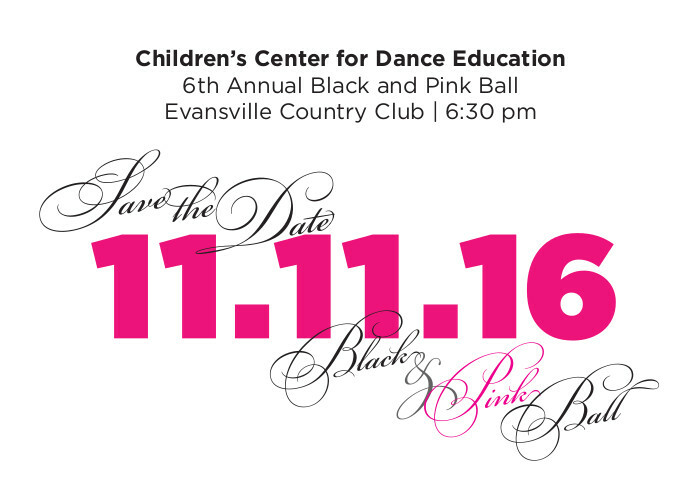 The Black & Pink Ball will be held on November 11, 2016 at the Evansville Country Club. Our format will include a silent auction, live music, performances, and appetizing food and drink. The evening is sure to be filled with warmth and friendship, but most importantly, a generous outpouring of support for the children that love to dance! The Black & Pink Gala is the largest fundraiser of the year for our organization. The proceeds from this event directly benefit our students, contributing to future productions, financial aid for dance classes and instruction, and dance education outreach programming. Children's Center for Dance Education instructors have the skill and knowledge to prepare children for life's obstacles through dance expression. Their rich experience brings a caliber of training, technique, and style that provide the foundation for many students to enter the world of professional dance. This year, we ask that you consider the gift of sponsorship for this year’s event – a gift that is tax deductible. Sponsorship comes in many ways and can also include items for our silent auction, underwriting for the event, and/or in-kind goods & services. It feels good to give back and support the community you live, work, or play in, and with your support we can offer a brighter future to the youth of Evansville and the surrounding area. We are excited about your involvement in this year’s event and ask that you send your pledge commitment information as soon as possible so that we can adequately prepare and give you as much promotion for your support. Along with this letter, you will find sponsorship information regarding different levels of support to make your contribution as quick and seamless as possible for your convenience. Children's Center for Dance Education was founded in 1995 on the principle idea that every child should have the opportunity to dance. On behalf of the students, staff, and board of directors, I want to thank you for your kind consideration of our request. Your contribution will help to ensure the thriving educational experience that Children's Center for Dance Education provides to the youth of our community. If you would like more information regarding the event or have any questions regarding corporate sponsorship, please contact us at (812) 421-8066 or purchase your sponsorship right on this page. We look forward to hearing from you!